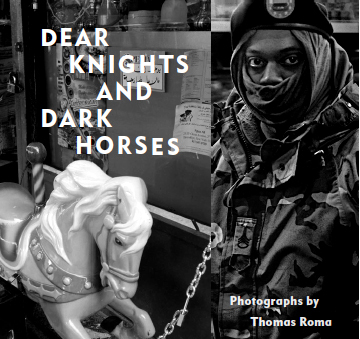 * About Thomas Roma’s book of his photogravure series "Dear Knights and Dark Horses"
Tabla Rasa Gallery is located in the burgeoning art destination of Sunset Park, Brooklyn. The fiercely independent outlier gallery is known for their consistently stunning exhibitions. Within the 4000 square foot turn of the century carriage house, the gallery exhibits primary and secondary market artwork by emerging, mid-career, and established artists, in all media, including painting, sculpture, installation, drawing, print media, digital, film and video. Twice the recipient of Guggenheim Fellowships, Thomas Roma's work has appeared in one-person and group exhibitions internationally, including one-person shows with accompanying books at the Museum of Modern Art NY and the International Center of Photography. His work is in numerous collections, including The Museum of Modern Art, New York, The San Francisco Museum of Modern Art, The Art Institute of Chicago, The Los Angeles County Museum of Art, and The Canadian Center for Architecture, Montreal. He is also a founding contributing photographer to DoubleTake Magazine. Mr. Roma's books include: Come Sunday (Introduction by Henry Louis Gates, Jr.), Found in Brooklyn (Introduction by Dr. Robert Coles. ), Old and On Their Own (with Dr. Robert Coles), Sunset Park (Interview by Richard B. Woodward), Higher Ground (Introduction by Ian Frazier), Enduring Justice (Foreword by Norman Mailer, Introduction by Robert Coles), Show & Tell (Text by Giancarlo T. Roma ), Sanctuary (Introduction by Henry Louis Gates, Jr.), Sicilian Passage, House Calls with William Carlos Williams, MD (Robert Coles), On Three Pillars,Torah, Worship, and the Practice of Loving Kindness, (Commentary by Phillip Lopate), and In Prison Air (Foreword by John Szarkowski). He has taught photography since 1983 at Yale, Fordham, Cooper Union, and The School of Visual Arts and in 1996 became the Director of Photography at Columbia University School of the Arts. Mr. Roma lives in Brooklyn with his wife Anna and their son Giancarlo.